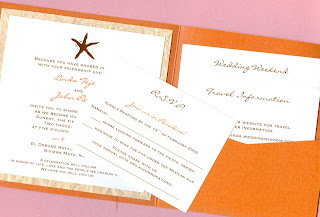 People often ask us what our most popular invitation is and normally we answer the blue starfish invitation. We’ve created this for at least 7 prior clients. 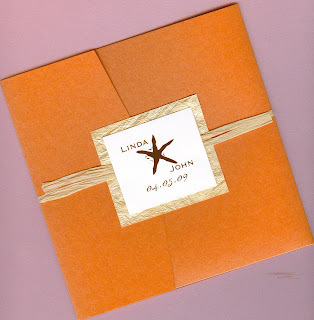 So you can imagine how excited we were to have the opportunity to work with Linda & John to recreate this popular invitation in their clementine and chocolate colors. Linda & John wanted to use bright fiesta colors on the invitation to set the tone for their destination wedding in Mexico. We think the finished product was beautiful. Enjoy! I still can't get over how thrilled I was when I recieved them in the mail. I was so happy with how you handled everything from beginning to end. All of our guests loved their invitations and they can't wait to join us for our Destination Wedding in Mexico! Your beautiful work really speaks for itself. We absolutely loved our invitations, and we certainly hope to work with you again in the future.